Two years ago, my wife bought me a Traeger Pellet Grill for my birthday. 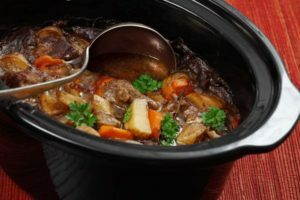 I know, old news… well, here’s another thing that it really jazzes up for us – BEEF STEW! The picture to the left? Not my crockpot. I’m not a photographer and even if I were, good pictures take a lot of time. That’s a Google image and for the record, this stew won’t have sprigs of fresh (uncooked) parsley floating on top. The directions for the last recipe were pretty lengthy, but in my defense, I was trying to walk you through the process of cooking something that you normally only attempt once per year and there’s usually a lot of pressure riding on how it turns out. I wanted to make sure you had all the hand-on-shoulder advice that you needed. That being said, Beef Stew is fairly easy. This entire process is about as set-it-and-forget-it as you can get. That doesn’t mean that there isn’t a little bit of prep work to do, but how much is really up to you. I prefer to use fresh veggies. I’m just picky that way. Frozen bags of mixed veggies will work just as well, but I think the fresh stuff tastes better. With that in mind, I dice the potatoes and carrots first. I rinse the potato after cutting it up in bite-sized cubes to remove as much starch as a quick soak and drain will cleanse. I don’t soak and drain the carrots, because you’re washing away flavor and vitamins. With potatoes, you’re only removing a little of the stuff that your body could do without anyway. I like to cut up fresh Green Beans (also known as String Beans), as opposed to dumping in some frozen Lima Beans or English Peas. Again, to each their own. Choose your favorite veggies. I don’t use mushrooms in my beef stew, but if you feel like they have to be there… go for it. Anyway, as crockpot cooking is slooooooooow cooking, I work with the potatoes, carrots, and beans first. Pour yourself 3/4 cup of your Beef Stock and set it aside for later. Pour the rest of the Beef Stock into the crockpot and start it on high. As it’s warming up, cut up your potatoes, carrots, and beans. You can let this cook for around 90 minutes before you cut up and add the onion, celery, and corn. This is a good time to stir in the Brown Sugar and about 3/4 of the bottle of Sweet Baby Ray’s Kickin’ Bourbon Sauce (save a little bit for later). After another hour of cooking, you’re ready to add your diced tomatoes and meat. If you want your stew to have a real kick to it, add half a shot glass of high quality bourbon. I don’t drink, but I do cook with it and it adds a nice little finish, provided you don’t overdo it. If you’ve opted to make this with frozen veggies, you can go all in with everything at once, including the celery and onion. Hopefully, you at least chopped them up fresh. Let the frozen mixture cook for about 45 minutes to an hour before you add the meat and additional sauces. Once you add the meat, it will be a little more challenging to stir. I think the fancy cooks call it “folding” when the pot reaches that stage of full. 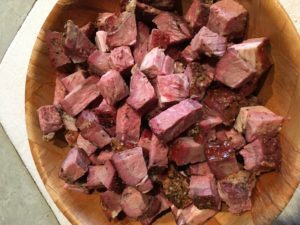 I like to make my Beef Stew with a Chuck Roast. You can choose from several different cuts of beef, but I like to have something that includes a little well-placed fat. If it’s too lean, I feel that it takes away from the final flavor. I cook the roast on the Traeger the weekend before I’m going to make stew and let it sit in the fridge for 2-3 days to “cure” (whatever that really means). I season the top and sides of the roast with Montreal Steak Seasoning prior to putting it on the smoker. Then, I cook it for 2½ on the smoke setting. This builds a nice, thick “smoke ring” into the outer layer of the meat. Notice the pink edges in the photo, which is from my cooker. Click on the photo, then click on the photo a second time when the new page loads, if you’d like to get a closer look. After 2½ hours, I push a meat thermometer into the thickest part of the roast, then wrap it in tinfoil. Once wrapped, it will go back on the smoker for another 3 to 4 hours of cooking. I want to hit a temperature of at least 145 on the thermometer. I’m told that 135 is medium rare and I know that 155 is brown to the core. I don’t want to put rare meat in the fridge and hold it for 3 days, so I try to find a happy medium between those two target numbers. I cut it into bite-sized squares for the stew and pour off any remaining juice that may have gathered in the tinfoil while it was in the fridge. Normally, I’d use that to make a gravy, but I told you earlier to save some of your Beef Stock for that step. Why would we possibly make gravy if we’re making stew? This is so that you can thicken the final stew to your liking. It’s just easier to do this in a separate pan and pour it into the crockpot as a fully prepped thickening agent. Knowing that you’re adding this to a broth that will be thin and soup-like, feel free to make your gravy a little on the thick side. Not cut-up-and-serve-with-toothpicks thick, but somewhere close to that neighborhood. There’s plenty of quick and easy How-To-Make-Gravy videos on YouTube. I embedded one for you, but feel free to watch others if you don’t like this guy’s method. You’re leftover Beef Stock and Sweet Baby Ray’s will serve as your starter ingredients. I don’t like to use Worcestershire in this gravy, as it messes with the taste that we’ve already got going. I want to stay with the flavoring that’s already present in the pot and just thicken it. I don’t want to introduce a new flavor. Here’s some other options for thickening the stew. After reviewing the list, you may find another method that you prefer, but I’d bet that you agree with me and favor the gravy option. Once you’ve added the gravy and “folded” it in to sufficiently blend the mix, you’re almost ready to find a ladle and a bowl. I’m patient, so I normally turn it down to warm and just give it about 30 minutes for the gravy to settle in and thicken things a tad. But, dig in whenever you’re ready to enjoy something truly mouthwatering. I hope you found this recipe helpful and are tempted to give it a go.